A posting from last autumn was unambiguously titled Bonds, Why Stick Around? The bearish premise was that despite a low-growth environment and negligible inflation….both favorable for fixed income products….the multi-year run up in bonds was largely orchestrated by expansionary monetary policy and that once this distortion was curtailed, there would be a massive move towards the exits as no one wanted to be the last one in the room. Indeed this fear was reflected in the market for U.S. Treasuries last summer when the Fed hinted that tapering its $85 billion in treasury and MBS purchases was in the works. Little has changed in financial markets or the economy since then…. except the continued dubious expansion of equities valuations, which was in no small part behind last week’s sell-off in shares. Yet despite the similarity between conditions in November and now, the lack of anticipated improvement causes one to draw a different conclusion and suggest that investors shift exposure back towards bonds for the medium term. This is not to say one should go overweight, but simply dial exposure up to an allocation suitable for current (and expected) economic conditions, which remain less than ebullient. 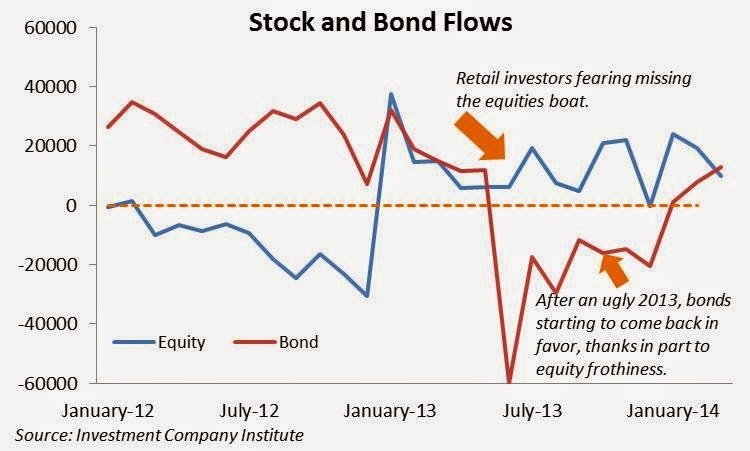 Bonds tend to be influenced by macroeconomic conditions slightly more than do equities. And key data still stink. Growth is slow and the Fed is onto something regarding its worries about inflation being too low. 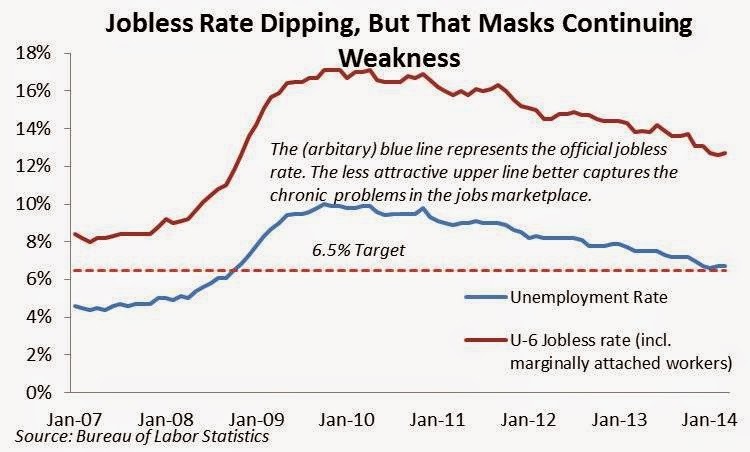 Certain jobs figures, which better reflect the true employment situation, continue to show persistent weakness. If GDP growth even hinted at returning to a long-term rate of near 3%, much less exceed that to play catch up from the half-decade long post-recession hangover, then we’d be in a sweet spot for financial markets, especially if interest rates remain in the current unprecedented range. Instead, the low-inflation, low-growth environment….along with overreaching equities valuations…means that relative to the alternatives (cash yields nothing after all), bonds may once again be the best game in town. Last autumn’s red-flag hanging over the fixed-income space was that bonds were the asset class most directly affected by Fed policy and once the extraordinary measures were curtailed, investor sentiment would sour as the marginal buyer (the Fed) disappeared. Furthermore, should growth actually accelerate, the currently dicey rational for investing in higher yielding asset classes like equities would be validated and a bond sell-off would ensue. But even with the Fed following through on its threat to trim monthly bond purchases by $30 billion, fixed-income products have maintained the lofty levels achieved over the past few years. 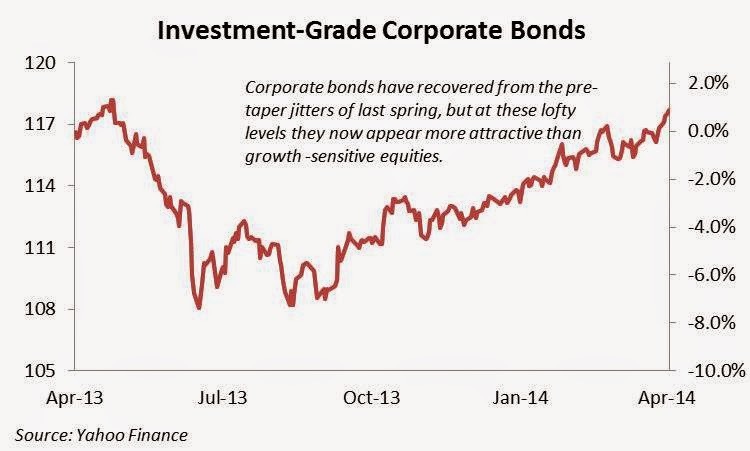 A popular investment-grade corporate bond ETF from iShares (LQD) has rallied 26% since late 2010. This gain includes the fund recovering from last spring’s pre-tapering jitters, and it now sits only 0.6% below its 2013 peak. Clearly whatever initial concerns investors had regarding the Fed ending the party were quickly dismissed. Similar sentiment is reflected in the iShares speculative bond ETF (HYG), which has risen 35% since late 2010, including a 2.4% gain this year. As seen below, this riskier bucket of the fixed-income space has roughly tracked the rise in equities during this era of QE, though not with the same dramatic trajectory. Investors’ cautiousness in further abandoning bonds is also reflected in the market for U.S. Treasuries. Over the course of last summer, the Treasury curve experienced a bear-steepening, as longer-dated notes and bonds sold off in expectation of interest rate increases over the next several years. Since then the yield curve has remained relatively stable. The greatest movement in yields was in the belly of the curve, centered around 3-Year to 7-Year notes. This is the period in which the market expects a return to more traditional monetary policy. Shorter-term notes are tethered to the Fed-Funds rate, which remains in the 0% to 0.25% range. Should the market’s expectation that rates stay the same deep into 2015 come to fruition, it will have been six years of zero interest rate policy. The fact that highly-educated and well-meaning policy makers believe the economy merits such extraordinary support for such a long period of time can be encapsulated in one word: disastrous. 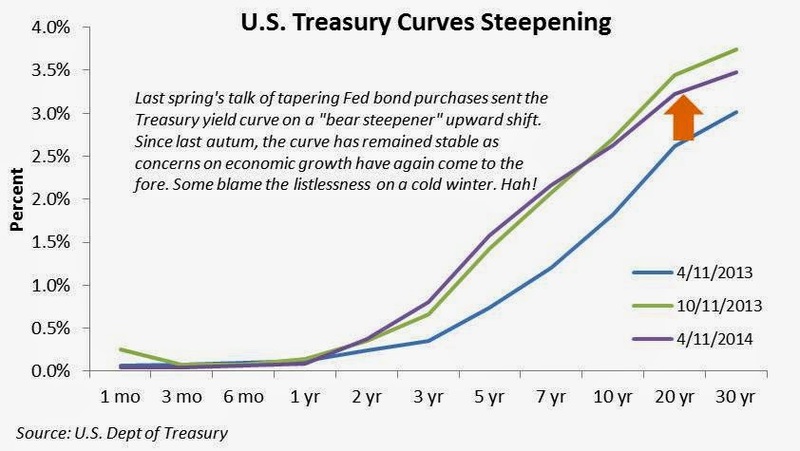 Steepening can be measured by the degree different sections of the yield curve have risen. Over the past year, the yield on the 2-Year Note has gained 54% to 37 bps while the yield on the 5-Year has more than doubled to 158 bps. In contrast, the 10-Year has only risen 45% to 263 bps (2.63%). The more muted activity on the long-end of the curve may be explained by Fed purchases as well as the reemergence of investor concerns that a low-growth economic environment may be in store for years to come. As in life, much of what determines the attractiveness of an asset class is relative. And a key contributor to a more favorable view of bonds is how far out in front of itself the equity market has gotten. Even after last week’s correction, valuations appear suspect, especially given a string of pedestrian earnings and tepid economic growth. The price-earnings (P/E) ratio on 12-month trailing basis is presently 16.6, which is 12% above its recent four-year average of 15. As stocks, by definition, are forward looking, perhaps more important is the P/E ratio based on anticipated earnings. At 15.3, it is 16% above its five-year average of 13.2, according to Factset and 11% higher than its 10-year clip. Given these lofty multiples, there is the distinct chance that the market trades sideways for a few quarters as earnings catch-up to the optimism recently exhibited by investors. Another….more dire…possibility is that the economy may enter a downturn…or a global crisis materialize…..and equities suffer as investors rush to the safety of bonds. The key beneficiaries of such a scenario would be Treasuries and the highest quality corporate issues. 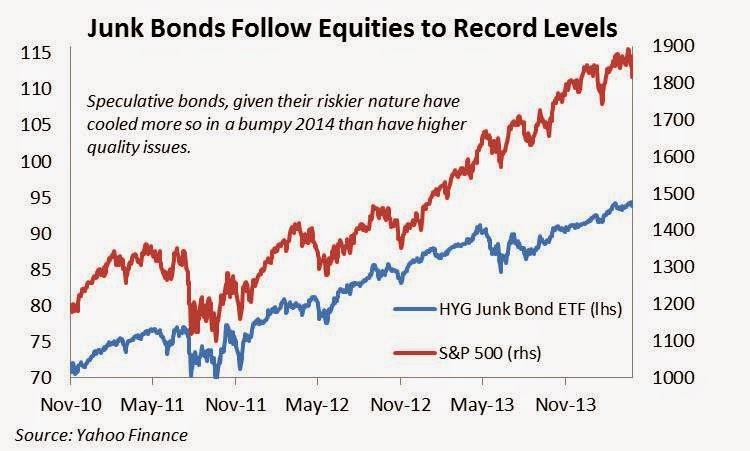 Junk bonds, conversely, would likely be toast. 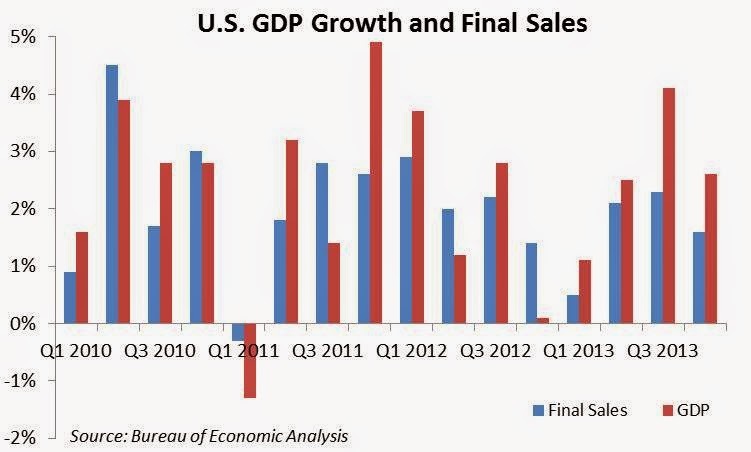 GDP growth in the United States during Q4 2013 chimed in at 2.6%, slightly better than the 2.2% annualized rate the economy has averaged over the past three years. Stripping away the effects of inventory build-up and exports, one arrives at a figure called final sales to domestic customers. This number more directly measures the appetite of American consumers and businesses to open their checkbooks. The news here exudes even greater mediocrity than do the GDP data. In Q4, final sales grew at a 1.6% annualized pace, a shade under the average registered since 2011. It is juvenile for some to insist that the standard post-recession bounce will inevitably occur. It won’t. It’s been nearly 20 quarters since this….ahem…recovery has begun. Another suspension of reality is the belief that the business cycle is no longer in effect. Just because growth has been slow, it does not mean the economy is immune to another downturn. True, recessions are often caused by the excess inventory build-up and rising interest rates that accompany an overheating economy, and we certainly are not in that situation; but peaks and valleys in the economy are inevitable. Now, however, they will likely occur on a lower plane. A shallow recession, which sounds tolerable, but that would be the flip side of persistent low-trajectory growth, which does not. Weak inflation data also reflects the economy’s chronic softness. 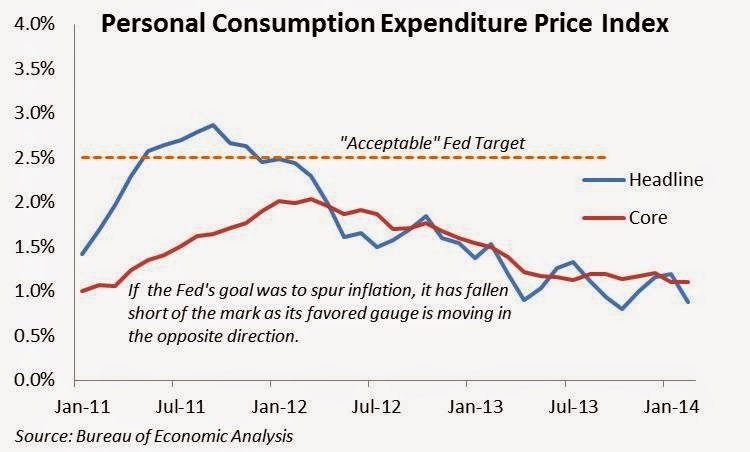 After all, the purpose of much of the Fed’s extraordinary policy is to catalyze upward price pressure. Yet despite throwing the kitchen sink, along with $4.2 trillion at the problem, the Fed’s favored inflation gauge, the price index for core personal consumption, registered a paltry 1.1% in February, dramatically lower than the 2.5% rate that it dreams about. 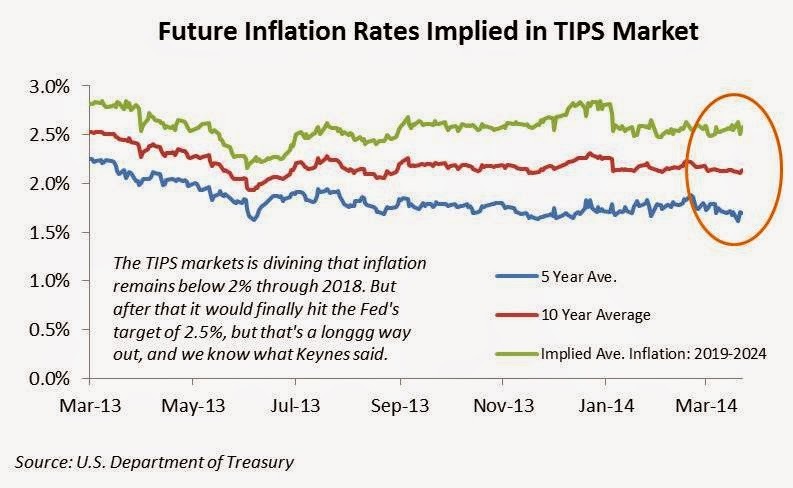 Why has the Fed been unable to light a spark under inflation? The answer lies in the other bucket of the central bank’s duel mandate: employment. 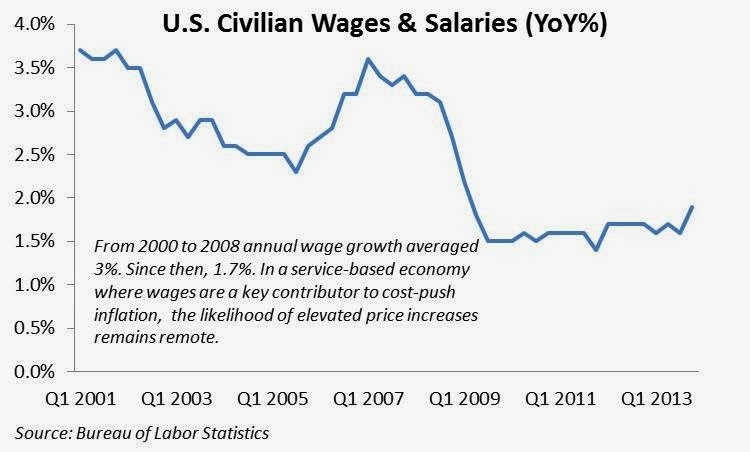 In a service-based economy like the United States, wages are a key contributor to inflationary pressure. Compared to developing markets whose price levels are influenced more heavily by raw inputs, the nature of America’s economy…both services and value-added manufacturing….means that the often-volatile price fluctuations of materials, energy products and foodstuffs are muted by the larger bucket of worker pay. As exhibited in the charts above, much of the employment situation looks like anything but a recovery. 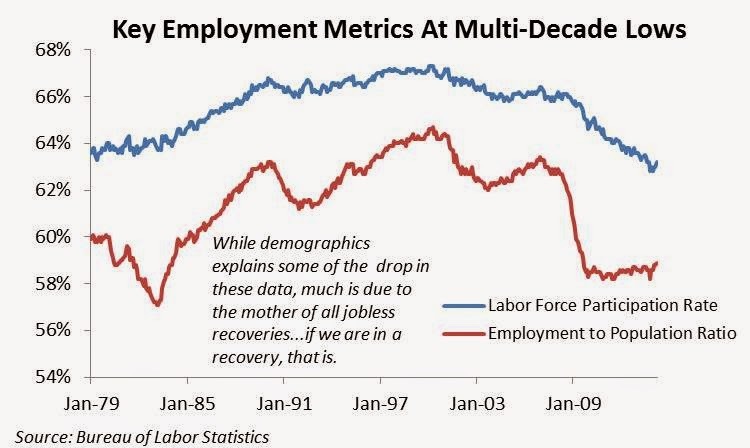 While some of the labor force participation rate.... 63.2% and barely above the multi-decade low hit last year….can be attributed to aging demographics, much of it is a consequence of able-bodied younger workers simply leaving labor pool in frustration. Whether counted in the labor pool or not, the longer a worker remains out of work, the greater his or her skills atrophy and thus the ability to command a wage similar to one earned in earlier, sunnier, times weakens. The difference between that original wage level and the new reality of lower…or no…wages is directly manifested in lost potential GDP and aggregate demand, especially in an economy comprised of 70% personal consumption. 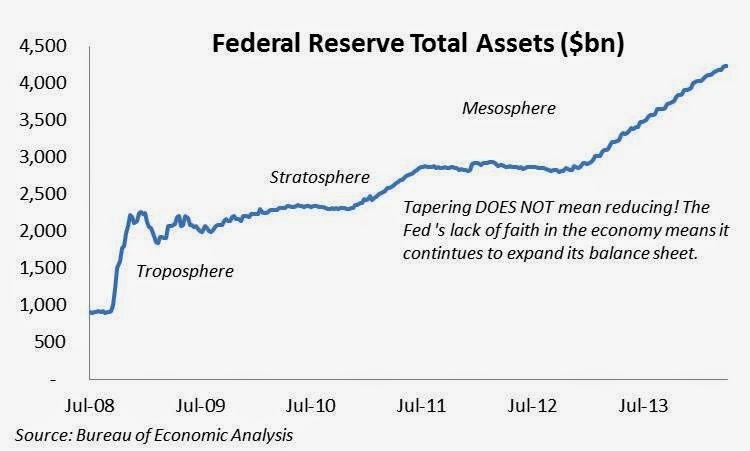 So how can the Fed print so much money and not have it goose the economy? Well that’s the head-scratcher of the century so far. While the answer remains elusive, the evidence is clear. 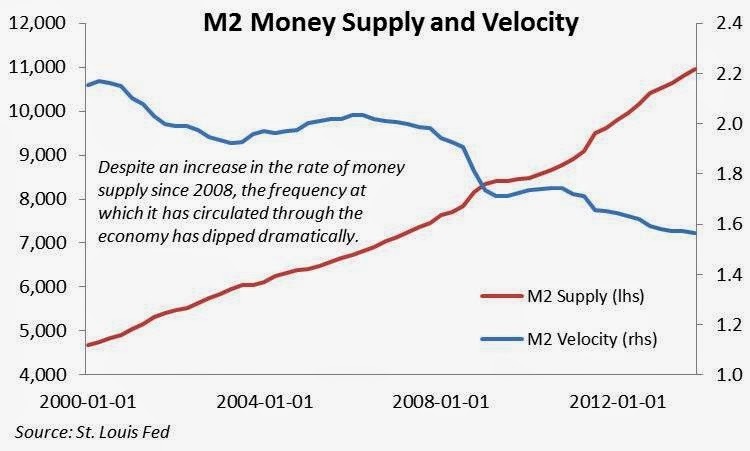 As seen below, M2 monetary supply has expanded by nearly 30% since early 2009. Yet the velocity of money, that is how many times it is circulated in the economy, has slowed considerably. Paradoxically much of these excess funds have been deposited back into the Fed’s vaults earning scant returns. But with economic prospects opaque and the regulatory hurdles for the financial sector ever increasing, banks have little incentive to deploy this bounty of funds into the broader economy. While the rationale to favor bonds is relatively simple from 20,000 feet, picking which fixed income instruments one should include in his or her portfolio is substantially more challenging. As referenced earlier, the belly of the Treasury curve has already sold off. Value could be found in those notes, especially if inflation remains muted over the next few years. Longer-dated bonds, with yields at 2.6% for the 10-Year, look slightly less attractive, especially as the Fed has never tested the various plans to sop up the excess money supply. The questions surrounding that inevitable task are what provide fodder for the apocalyptic hyperinflation and gold-bug cults. Neither investment grade nor speculative bonds offer yields worth writing home about. But with the risk of either an economic downturn or a sell-off in risky assets both plausible, the logic of holding riskier junk bonds for only a marginally better return than those of high-quality issues is questionable at best. Lastly, an investor can look abroad. Emerging markets have historically offered higher interest rates in order to garner the attention of investors who would otherwise shy away from illiquid, opaque and sometimes dodgy economies. 2013 was brutal for these markets meaning there are pockets of value likely to be had. One should steer clear of economies with weak fundamentals, namely unsustainable budgetary and current accounts deficits or ones experiencing political instability. Major names on this not-so-short list are Russia, Turkey, Thailand, Venezuela and Argentina, although some brave souls have ventured to the bond markets for the latter two, driving up their YTD returns into double-digit territory. Talk about living on the edge. The attraction of this trade has been the positive carry of borrowing funds in low-interest markets like the U.S. Japan and Europe and purchasing higher-yielding emerging market-denominated instruments. A bonus has been the appreciation of EM currencies vis-à-vis the dollar, which further gooses returns. Even if U.S. GDP growth remains sluggish, the Fed will likely continue its tapering and investors will expect interest rates hikes, no matter how gradual, to ensue shortly thereafter. This will put upward pressure on the dollar. But an appreciating dollar vs. EM currencies will only slightly offset the positive carry of the higher interest rates in these countries’ bonds. Just because the pendulum has swung ever so slightly back towards bonds and away from frothy stocks, does not mean the asset class is a gold mine. Yield is still hard to come by in a low-growth world with rampant market distortions putting downward pressure on fixed-income returns. This reality is in part why bond investors, in their search for yield, have expanded the definition of fixed-income and pursued such strategies as unconstrained funds. Desperate times call for desperate measures. We’ll save that discussion for another day.